BRISTOL, Tenn. (June 18, 2017) – The Levi, Ray & Shoup Ford Shelby Mustang Funny Car team was elevated after a strong qualifying performance at the 17th annual NHRA Thunder Valley Nationals that entitled them to their first low qualifier award of the season. Tim Wilkerson and his steadfast crew had nothing to hang their heads over on raceday at Bristol Dragway as they powered to a round-win and continued to fine-tune their program at the third race of four in a row to start the summer. Throughout qualifying and on raceday, Wilkerson was the only Funny Car to run in the 3.8-second zone. His 3.895-second pass at 328.22 mph on Friday evening held as low elapsed time and top speed of the entire meet. After nabbing the 19th pole of his career, Wilkerson lined up on Sunday for a first-round meeting with Bob Bode. The air was thick with moisture and the racetrack was hot and unforgiving by the early afternoon kick-off. 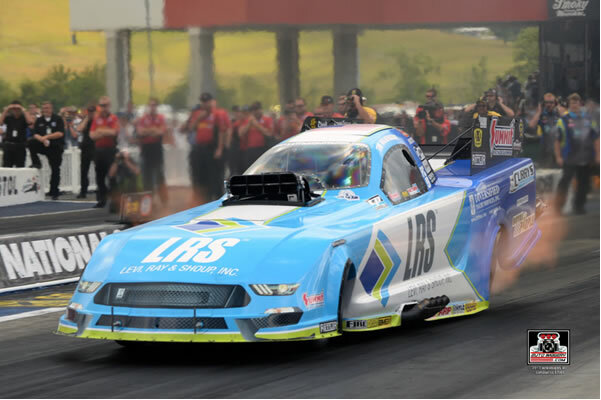 The nitro beasts were either slow or plagued by tire-smoke in the tricky conditions, and Wilkerson lumbered down to victory on a 4.367, 233.12, leaving behind a traction-troubled Bode. "I could feel it had cylinders out, and they told me [over the headset] that it was smoking the tires, so I shut it off," explained Wilkerson. "The second round, I drove it to about 850 feet and I could see half of Tommy's car out in front of me. I knew there wasn't any use beating it up any more than that – it probably would have went a 4.16 or something like that, but it wasn't going to be an .08." Wilkerson was dropping cylinders soon after leaving the starting line as his LRS Mustang battled the racetrack. Ultimately, he was defeated by Tommy Johnson Jr., 4.083, 314.53 to 4.220, 262.18. The day was shorter than Wilkerson and his team had hoped for, but they know the future is bright. "Well, our car is a turtle, but it's a little bit faster turtle now," said Wilkerson with a grin. He is now No. 8 in the Funny Car standings. "I'm happy about that. It's showing a lot of progress. We went down the track every run this weekend. I shut it off early three out of the four runs to make sure it didn't hurt the motor, but going down the track every run makes me feel a lot better than what we had been doing. We get to go to Norwalk and Bill Bader's racetrack next week for the Summit Racing Nationals, and that's one we've been looking forward to. Hopefully we can go some more rounds there."